This silk screen printing machine can print onto clothing (especially for T-shirt), woven fabric, metal, paper, copybook, plastic, circuit board, wood, glass, ceramic tile, leather and other plane printing substrates, which is especially suitable for small businesses and individual printing shop. Our 4 Color 4 Station Single Rotary Screen Press can simultaneously install four screen plates. The screen layer is able to rotate independently upon installation, then it is available for 4 colors' overprinting and making progressive proofs. This silk screen printing machine is all-metal construction, advanced electrostatic spraying and electroplating, durable and easy to clean. Silk Screen Printing Machine.The size of platen is 45*55cm(18*22inch) . 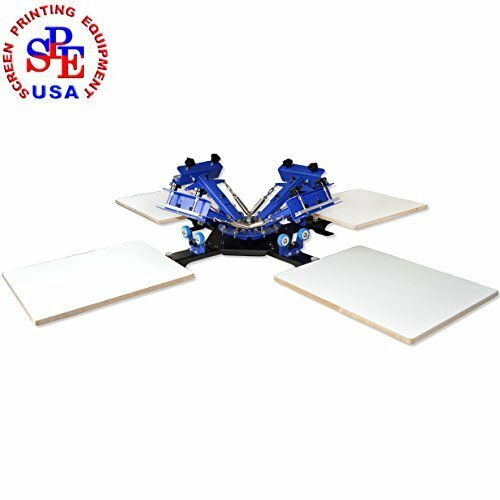 Screen Printing Press Table type and combinatorial design saves place and convenient for transportation. The Code Number:006432 This silk screen printing machine is all-metal construction, advanced electrostatic spraying and electroplating, durable and easy to clean.